I’ve always been a little obsessed with beets. As a kid (and holding a piece of lettuce near me would send me into a fit) I would feast on piles of cottage cheese, sunflower seeds, bacon bits, croutons, and pickled beets on trips to the salad bar. Not mixed together, of course. Though I still love the beets that come out of jars and cans, I’ve become fond of the fresh beets that you can pick up in the produce section at the grocery store these days. I used to roast them, but then I tried this recipe and really liked how it blended fresh, light ingredients with that vinegar flavor I love with beets so much. This is an adapted Ina Garten recipe from The Barefoot Contessa Cookbook. Sorry Ina, I love you and all, but I can’t be spending $10 on raspberry vinegar. I used balsamic instead. 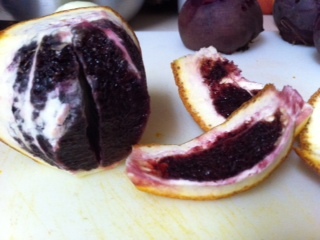 I won’t lie to you either… If you eat fresh beets, you will poop purple. No joke. Get ready. 1. Trim the tops off of the beets and boil uncovered in salted water for about an hour, until they are soft. 2. Once the beets are cool enough to handle but still warm, peel and dice into small cubes. Everything will be purple! 3. 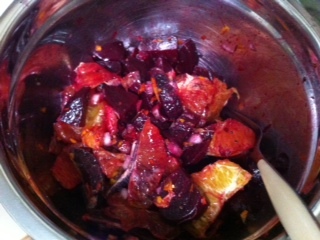 Mix the beets with the onion, orange segments, olive oil, orange juice, and balsamic vinegar. Season to taste with salt and pepper. 4. Serve at room temperature or cold.